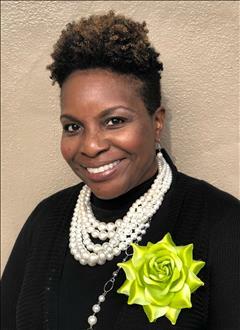 Obituary for Mary L. Clinton | Collins Funeral Home, Inc.
Mary Luccrecia Clinton, affectionately known as “Cree”, was born to Thomas E. and Ollia M. Clinton on February 2, 1971 in Marion, South Carolina. She was the youngest daughter and was the epitome of a faithful daughter and sister. She always made sure that she did whatever was needed to take care of her family. She was the “Super Glue” that formed the tight bond between her siblings and she absolutely loved her “Heartbeats”, the term she used to affectionately refer to her parents. Cree accepted Christ at an early age while growing up and serving in Hyco Baptist Church, located in Cassatt, SC. Over the years as she moved around the country, she made it a priority to stay connected with a church family. While living in Virgina, she joined and served at Pleasant Grove Baptist Church. After relocating to California, in 2013 she joined Mount Ennon Baptist Church (MEBC) in Clinton, MD. She was one of MEBC’s first “e-Members”. She faithfully worshiped and served as a dedicated member of the Social Media Ministry; a role that she delightfully performed. She worked tirelessly behind the scenes to connect thousands of people to God’s Word using FaceBook, Instagram, Twitter and many other social media platforms. She also moderated the MEBC online “Chat Roll” during worship services; welcoming hundreds of parishioners from across the globe on Sunday mornings to listen to the Word and praise God. Cree attended Kershaw County Public Schools, graduating from Camden High School in 1989. After high school, she attended Winthrop University and obtained a Bachelor of Science Degree in Business Administration in 1993. In 2002, she earned a Master of Business Administration with an emphasis in Health Services Management from Webster University. In 2003, she received her Project Management Institute (PMI) Project Management Professional (PMP) certification and in 2018, the Teaching English for Speakers of Other Languages (TESOL), International Open Academy certificate. California. After settling into her new life on the west coast, she went back to what she does best, serving others by joining the Alpha Nu Omega (ANO) Chapter located in Oakland, California. Once again, Cree served in numerous roles and gave 110% as she upheld her commitment to promote sisterhood, scholarship and “Service to All Mankind”. In 2016, Cree became a “Silver Star” for having twenty-five years of sorority service. She was most proud of becoming an Alpha Kappa Alpha Sorority, Inc. Life Member. McKesson for her outreach. She was an avid mentor, who never turned away requests for help or assistance. Cree loved reading, traveling, and relating to people of all walks of life. In 2010, she co-founded the national book club Women interested in Rewarding, Enlightening, Discussions (WiiRED) thru Books along with her sister Cynthia. Cree loved to travel and seized every opportunity to explore other cultures, foods, sights, and the local experiences. Her favorite travel partners were affectionately known as the “Chicas”. Cree never met a stranger and was able to relate to anyone by finding some sort of connection. She had the ability to make you feel “right at home” in her Girl Raised in The South (GRITS) special way. Cree touched so many lives and was treasured by her family, colleagues and many, many friends. She will be missed forever. Left to mourn Cree are her beloved parents, Mr. Thomas E. and Ollia M. Clinton; siblings, Janie (Charles) Briggs of Cassatt, SC, Vaughn (Beverly) Clinton of Los Alamos, NM, James (Patrice) Clinton of Awendaw, SC; Cynthia ( Jonathan) Clinton-Brown of Waldorf, MD; Narlin (LaToya) Ramsuer of Chesapeake, VA; partner, Eric Martin; aunts, Ozella W. Edge, Anna Blanche Sutton, Arlene Clinton and Marty Clinton; nieces, LaToya Nesbitt, Persephone Clinton, and Cynphany Brown; nephews, Taurean Briggs, Preston Clinton, Matthew Brown, Vaughn Clinton II, Isaiah Brown, Xavier Clinton, Zarina and Amiri Ramsuer; two grand nieces Taylor and Rikema Weathers; one grand nephew Josiah Shields; godson, Christopher McClendon and a host of many other family and friends.